This piece is still in progress. There are still some unfinished bits in both the Python wrapper and this HOWTO. The GUI is still unfinished, the database connectivity is still not fully described, and there are some typos (and probably a few thinko's as well). However, what's written below is essentially correct. FORTRAN has the reputation for being old, crufty, quite hard to use and stuck in some very old programming paradigms. However, recent versions of FORTRAN include very modern abilities and many people are still using it, especially for pure number crunching as the compilers are still among the best for doing so. FORTRAN does not provide easy access to GUI's, relational databases, or methods for handling options (AFAIK - please correct), while many scripting languages, such as Python & Perl do. This is how I converted a very sophisticated, but fairly UI-ugly (and hard-to-modify) FORTRAN program to one that uses Python as the application glue. Python was used to do the scut work of command-line user interface and configuration file management. It was also used to add an optional GUI to it and record some usage to a relational database. I used the f2py module of the scientific Python package numpy to do the FORTRAN compilation and generation of the shared lib, and then used Qt-designer and the Qt widget set to draw the GUI and then PyQt to convert it to Python. That sounds quite complex, but as you'll see, it's not especially if you use a recent version of Linux as all the required packages are available for free. This was the 1st time I've used numpy for this and it worked much better than I had expected. My previous experience had been with SWIG (the Rosetta Stone for mixing computer languages), and while SWIG allows you to do tremendous magic, it was a slog to get it to work. With numpy and f2py, it just worked. The end result is a more easily maintainable program that separates the FORTRAN math engine from the user interface, provides a more standard option-handling and configuration file capabilities, provides the (optional) GUI, and also adds reporting to a remote relational database for use and platform tracking. All this in about 300 lines of code which includes much debugging. The initial problem was that a researcher had a great Magnetic Resonance (MR) analysis program for proteins that he wanted to be more user-friendly. It was written in FORTRAN and ran quite efficiently, but it was difficult to use. I was initially going to try to improve the efficiency but for a number of reasons that was not a priority at this time. Ease of use, ability of others to help improve it, and multi-platform ability were higher priority for the researcher. Since I had some experience with Python, I decided that this would be a good time to try out the f2py functionality of numpy. The original FORTRAN code I was given included 3 FORTRAN source files totalling 1880 lines and some associated configuration and support files. The above line uses the gfortran compiler (aka gnu95) which seems to both generate marginally faster code and is also more compatible with MacOSX than the g95 compiler I 1st tried (g95 worked fine on Linux, but had problems on MacOSX due to API incompatibilities with numpy on MacOSX). The end result of this command was a shared lib fd_rrt1d.so which is callable by subroutine name by both Python and FORTRAN (the FORTRAN code calls several subroutines spread over those 3 files). That is one of the magic things about the numpy package; it all works the way it's supposed hiding the considerable magic. However, I installed a newer version of liblapack (liblapack-dev, from the Ubuntu 8.04 tree and recompiled and that seems to have addressed the issue, even tho the previously offending symbols are still undefined. No, I don't understand this. I wrote a skeleton Python program that assigned the variables and called the FORTRAN code. Astonishingly, it worked on the 1st try, so I continued to expand the skeleton to add the commandline option-handling. There 4, count 'em, 4 ways of setting options in the 1D app. The easiest is to set nothing, which causes the internal, hard-coded defaults to be used. If there is a configuration file, the values set in that file will override over the defaults. The variables that are not set in that file will use the defaults. If you set values from the commandline (—wmaxo=4000), those will override those set from the config file as well as the defaults. Finally, those variables that are set from the GUI have the highest precedence. There's a bit of logic code that determines all that, but it's not complicated. Python has a standard way of providing commandline option handling this via its getopt package. It's probably not the best, but there's a lot to be said for doing it in a semi-standard way. It's also very easy to implement. The following is the entire option-handling code for the MANY options that it supports and reads any defined commandline option in, then either calls a function (such as —gui) or does some munging of the variable (—wmaxo) and sticks it in a dictionary (aka hash) for easy lookup and passing to other functions. If the option is unrecognized, it just calls the usage() function to let the user figure out the error of his ways. print "There was an error specifying an option flag. Here's the correct usage:"
print >> sys.stderr, "cheat must be '1' or '0'"
print >> sys.stderr, "cheatmore must be 'T' or 'F'"
User-written FORTRAN code then parsed this to set the variables. In providing the Python front-end, it was extremely easy to provide a more sophisticated way of doing this using the configobj module which is designed to do just this. if paramfile != "": # If there's a param file named, try to get params from it. I had to add some logic to allow options entered at the commandline to override those in the configuration file, but essentially the code above was all that was needed to support a configuration file that allows key = value pairs that can be nested into arbitrary stanzas. Here's an extract of the config file showing assignment of strings, ints, and floats. Note that all values are interpreted as strings and have to be coerced into the appropriate type - see above in the option-handling section. The config file included in the tarball includes a summary explanation of how the file is structured and the URL to the home page of the configobj module. # assumed to be in the current directory. 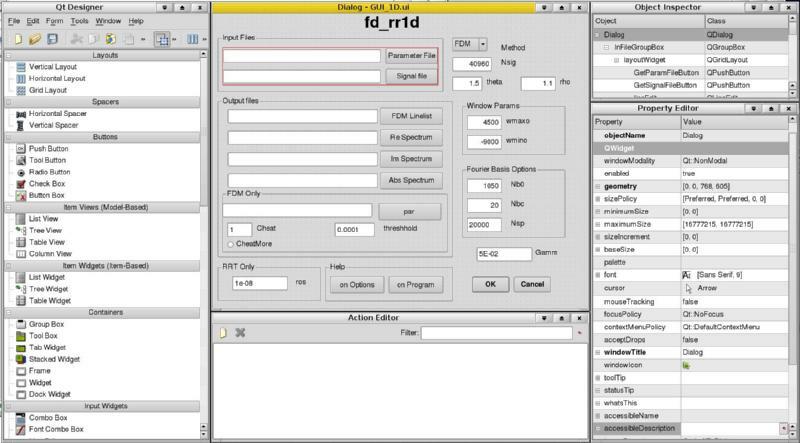 After the UI is drawn and saved as GUI_1D.ui (an XML representation of the design), the UI file is converted to Python code using the PyQt utility pyuic4. The code required for making the proof of concept (a GUI that pops up and allows the user to set all the options graphically) is actually quite concise (the complexity is hidden in the Qt lib that you link to). # don't forget to erase the no-longer needed class and defs when finished. QtApplication, ditto the form itself, and show it. the params, connect signals & slots, do error-checking, etc. but this pops it up. When releasing a piece of academic software into the wild, it is often useful to the author to figure out how it's being used so that she can rewrite instructions, concentrate on most-used features, find out the platform distribution, etc. This mechanism can be exploited trivially using Python's Relational DataBase (RDB) connection module. During the run of this program, the Python wrapper provides all the variables, times the execution of the run, and can provide some network information to the author. This information is presented at the end of the run with a request to send the info back to the author. If the user agrees, the Python wrapper attempts to contact a pre-defined database server and send back the information. show that information and ask the user's permission to return it. if granted, connect to the remote RDB and execute the INSERT command. The information returned includes the date, the hostname, IP #, and OS of the computer, all program variables, the program run-time, and some platform information about the machine that ran the program. Here's the info collected. Note that the sysinfo string is the full output of lshw -short and should be trimmed considerably. The entire data to be returned (formatted as above) is presented to the user just prior to sending it, so they have the opportunity to refuse sending the information. Presenting help files in an easily navigable way usually requires a hypertext browser or a custom screen pager. Python offers a very easy way to present any text file via any pager application on the system. Since most *nix-like systems have the less pager, I just called that pager on the help file. Here's the entire function that presents pagable help text. help_txt = help_fp.read()                # read in any text from a text file. print "Can't find the help file - should be called '1d_orig_help.txt' - Did you rename it?" The entire code tree can be downloaded The from here. The File Manifest is included; those files not explicitly named are probably not required.